The D.D.D. Company was started by Decatur D. Dennis who sold a patent medicine called the D.D.D. prescription that was purported to cure the entire spectrum of skin disorders. According to the July, 1897 edition of the “Druggists Circular and Chemical Gazette” he registered the “D.D.D.” trade mark (No. 30147) on June 8, 1897. At the time, he was located in St. Louis, Missouri. An advertisement, presented to look like a newspaper article in the June 23, 1907 Sacramento Union, provides a general description of the company and it’s product. Scientists have at last found how to conquer skin diseases. For generations medical men have been experimenting with internal treatment to cure eczema, but the progress in the germ theory has shown that the old fashioned medical schools were on the wrong track. As it is now known that eczema, psoriasis, salt rheum, ringworm and all kinds of rashes are caused by germs which lodge in the skin, the best skin specialists have come to believe that the skin can be cured only through the skin. The application externally of oil of wintergreen, mixed with soothing ingredients, strikes right at the germs and destroys them effectually. Properly mixed this makes a powerful wash, yet so mild and harmless that it can be used as a gargle. The mixture is prepared according to the prescription of a well-known skin specialist, Dr. Decatur D. Dennis. 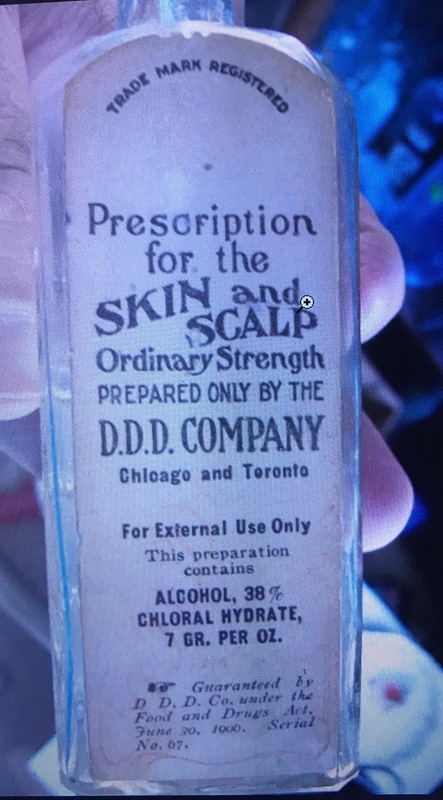 It is compounded in Chicago and has been sold for years by druggists under the label of D.D.D. Prescription. According to census records and various city directories, Dr. Decatur D Dennis was born in Texas in 1867 and apparently, shortly after registering the trade mark he returned there and was listed as the president of the D.D.D. Company in the 1899 Galveston, Texas Directory. In 1900, he was still listed as president of the D.D.D. Company but by then the company address was listed in Chicago at 70 Dearborn Street. According to 1900 census records, during the same time period, Dennis was living at a nearby hotel. In 1901, The D.D.D. Company was still listed at 70 Dearborn with John W. Baker named as president and Benjamin E. Page as secretary. Meanwhile, Dennis was back in Texas and listed as a physician on East Lamar Street in Dennison. So it looks like Dennis’s brief visit to Chicago resulted in a successful effort to sell the business. The D.D.D. Company remained listed at 70 Dearborn with Baker as president in 1902. Then, sometime between 1903 and 1905, the business moved to 118 Michigan Street where it was listed in 1906 with Page named as president. By 1911, the company had moved again, this time to 3843-45 East Ravenswood Park Avenue. The company remained there through the mid-1920’s with Page as president, after which, I lose track. The company must have grown quite quickly into a national and international presence. By 1913, they were advertising in most if not all parts of the country with local druggists acting as their agents. I’ve found newspaper advertisements for D.D.D. in Kingston, N.Y. (1903), Sacramento, California (1907) and Denver, Colorado (1913). In 1924, I even found an overseas advertisement for them in a New Zealand publication called the New Zealand Truth. The company’s end date is not clear. 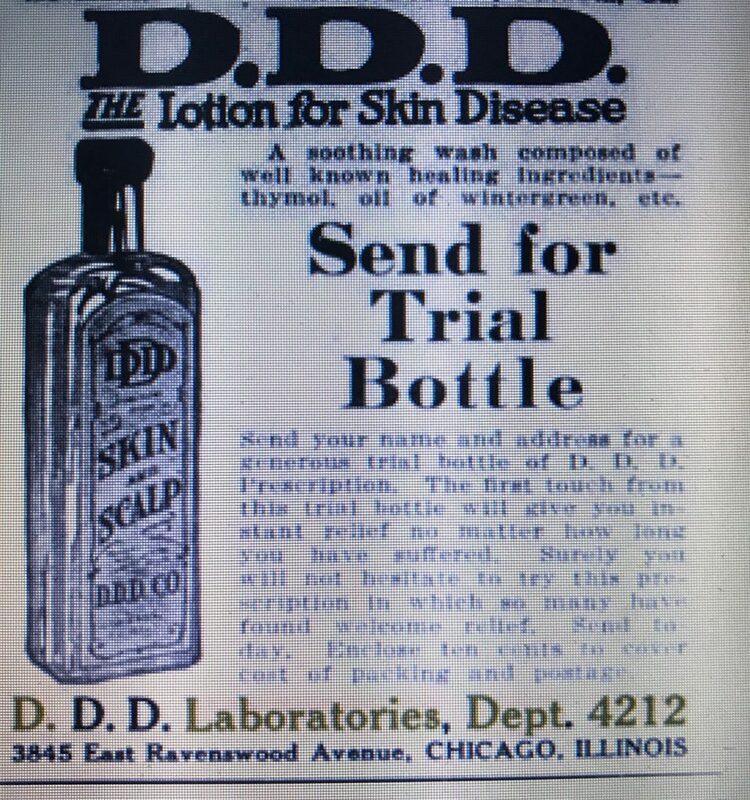 The company was not listed in the 1930 Chicago directory but continued to advertise the D.D.D. Prescription (without an address) well into the 1950’s. I’ve seen advertisements in Life Magazine as late as 1952. 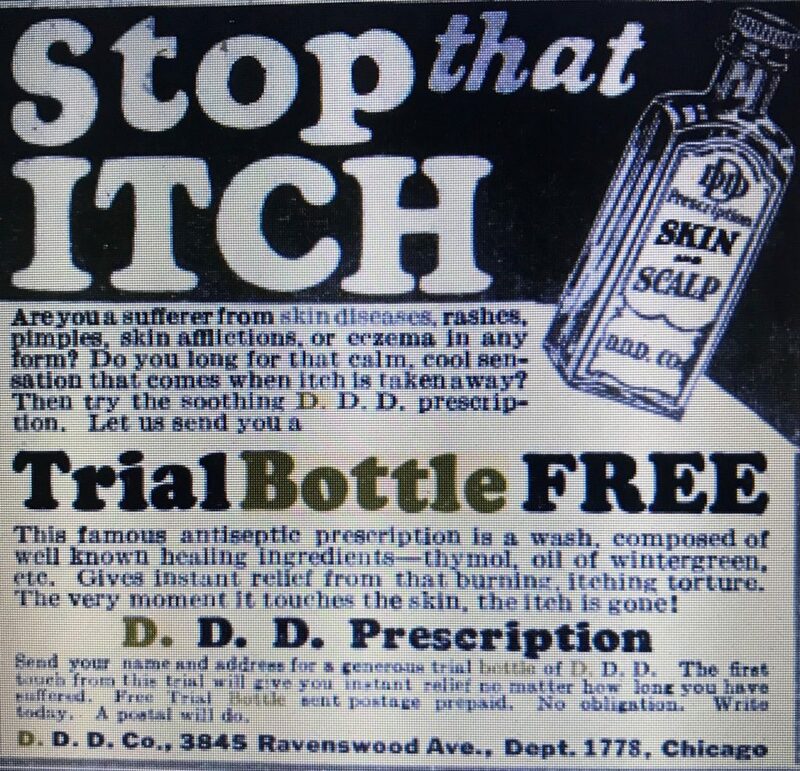 In regard to the product itself, an early advertisement in 1903 boldly claimed that each of these skin afflictions is parasitic in nature and all of them have yielded to D.D.D. Acne, Barber’s Itch, Carbuncles, Acne Rosacea, Dermatitis, Eczema in all its forms: Eczema in Infants and Young Children, Erythema, Impetigo, Contagious, Lupus, Lichen Planus, Herpes, Erysipelas, Ichthyosis, Pityriasis, Itching Piles, Lichen Ruber, Psoriasis in all its forms: Scrofula, Seborrhea, Mycosis, Scabies, Tinea Favosa, Tinea Circinata, Tinea Trichophytina Barbae, Lupus Serpiginous, Elephantiasis. Apply the remedy with a piece of absorbent cotton or an atomizer to the parts affected two or three times daily. After a few treatments the disease will begin to dry up and form more scales and scabs than appeared at its natural stage. The patient should not remove them but let nature throw them off. I suffered for the last ten years. Every effort that I tried-most of them doctor’s prescriptions- and even injections given in my arms; and in the army, injections in my back failed to do me a bit of good. Today I am proud to say after using a few bottles of D.D.D. I am almost cured of that hated disease. The other day a friend of mine who was suffering from eczema came over to thank me because I told him to use D.D.D. M Kaspar, 55 Grove St., Chelsea Mass. D.D.D’s miraculous claims concerning the theraputic effects of their product caught the attention of the U.S. Department of Agriculture who alleged they were misbranding the product in violation of the Food and Drug Act. In the late teens and early 1920’s, there were at least three instances where shipments of their products, circulars and booklets from Illinois to other states were seized for this reason. In two instances, D.D.D. chose not to appear for the property and it was destroyed. In one case, where they did appear, they were fined $2,000 and in addition had to pay for the cost of the proceedings. “D.D.D.is no ordinary patent medicine but the preparation of a skin specialist, Dr. D.D. Dennis, who used the compound now known as D.D.D. successfully for years on all patients suffering from skin diseases. In August 1910, a man who had used 48 bottles of D.D.D, for eczema wrote to the Journal and complained that it had not relieved his eczema. He complained that he had lost fourteen pounds in weight, had become weak and emaciated and was “generally miserable.” This example of the danger the public runs in using “patent medicines” containing such insidious poisons as chloral hydrate, emphasizes the need of a “poison label” requirement being added to the federal Food & Drugs Act. Today, according to medlineplus.gov, chloral hydrate can be used as a sedative in the short term to treat insomnia and relieve anxiety. There’s no mention of its use in treating skin disorders. Not surprisingly, as time went on, the word cure disappeared from their advertising. This 1937 advertisement from Popular Mechanics still stresses the fact that its made using “Doctor Dennis’ original formula,” but the focus of the ad is now on itch relief and no longer mentions the elimination of the root cause. The bottle I found is a square shaped medicine that contained approximately five ounces. 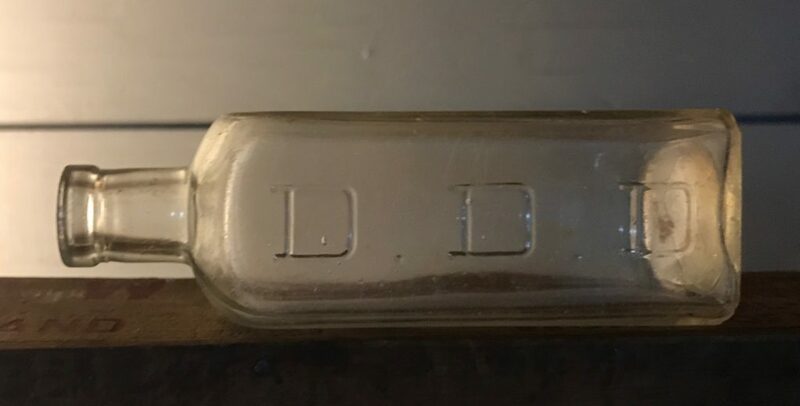 It’s machine made and the makers mark embossed on the bottom is an “I” within a diamond, indicating it was made by the Illinois Glass Company. There are no date or factory numbers included with the mark so according to various web sites it was probably made between 1914 and 1929. The following two advertisements serve to narrow down that range. The first is from 1923 and shows their bottle with a cork finish. The other is from 1925 and shows a screw top finish. This leads me to believe that the company switched from cork to screw top around 1924, making this the end range for the bottle’s manufacture. Previous Previous post: Atlantic Dairy, Bedell Bros., Freeport, L.I.